Start your stay in the best position possible with a luxury suite at Bondi Junction. You’ll wake up just a minute’s walk to the shopper’s haven of Westfield Bondi Junction and a short drive to the gorgeous Centennial Parklands for markets, festivals and other events. This location also has Bondi Junction Station built right into the hotel’s lower level, making it incredibly simple to travel into the Sydney CBD or of course, to spend long and lazy days soaking up the sun at spectacular Bondi Beach. Cafe Parisienne, 94 Bronte Rd (7 minute walk) A cute little slice of France an easy walk from your suite. Cafe Parisienne offers up nourishing dishes such as paté, cherry duck and salmon selections in a cosy restaurant. Earth to Table, 85 Bronte Rd (7 minute walk) Here you’ll find delectable vegan and vegetarian fare served in a range of creative dishes, all originating from a dedicated focus on organic and plant-based cuisine. Spring Street Social, 110 Spring St (4 minute walk) When you’re looking for Bondi Junction’s nightlife go underground, for some of the area’s best live music and cocktail specials at this vibrant local music venue. Westfield Bondi Junction, Oxford St (1 minute walk) Explore fashion, food and other treats from over 400 retailers in this multi-level shopping paradise, right at your doorstep. Bondi Beach, Gould St (13 minute drive) Searching for a new bikini or for Bondi souvenirs? Simply peek into some of the colourful boutiques set back from the beach. Bondi Markets, Campbell Pde (13 minute drive) Find artsy, bespoke and vintage goods and enjoy a relaxing stroll with croissant in hand at the Bondi Markets on Sundays. Journey: A 25-30 minute trip from Sydney Airport (Domestic) to Meriton Suites Bondi Junction. Journey: A 20-30 minute trip from Sydney Airport (Domestic) to Meriton Suites Bondi Junction. Note: Trip time is dependent on traffic conditions and drop-offs. Costs may change without notice. Subscribe to enjoy our exclusive offers! All you need to do is provide your details and then you’re done! Your next holiday is just a click away! 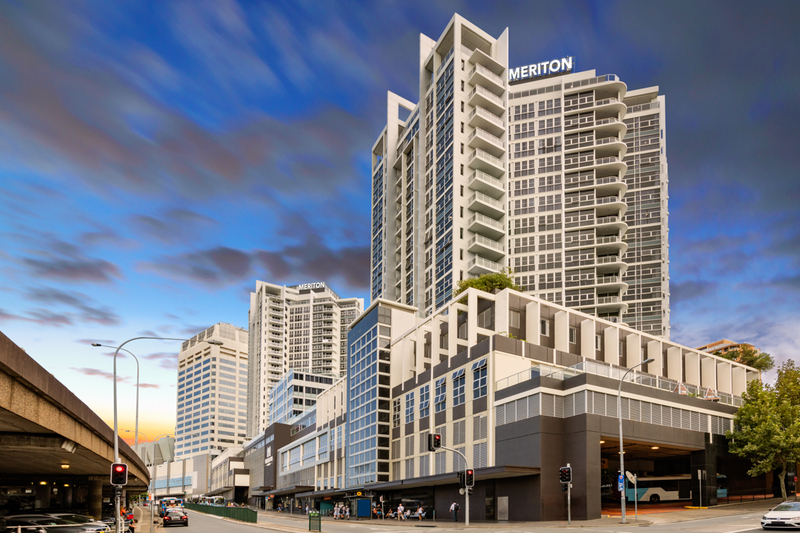 By submitting this form, you agree that Meriton Suites can email you regarding accommodation specials, exclusive offers, news & updates. If in the future you do not wish to receive promotional emails, you will have the option to ‘opt-out’.